First off amazing add on, it makes my life easier! Now for some problems I am having since the latest XenForo upgrade. How would I go about fixing these errors so I no longer have issues. Please copy and paste the error from the admin area here. The screenshot does not allow me to see the entire line of some of the trace information. But if I had to guess, I would guess that you don't have the PC sender name set to a valid user for your form. So far as the multiple submissions, it could be people trying to submit the form multiple times after they get the error message. Yep that fixed the Errors on the Deny/Approval. The error the user saw IS (or should be) the error that was being recorded in the backend. Had a question about user field criteria. I thought this was there so they couldn't use the form unless that user field is sstisfied. But it doesnt seem to work that way. Can you please explain? That's exactly what it does. If the user does not meet the criteria for the form, they can't fill out the form and don't have access to it. There's really nothing to explain. The criteria system is part of XenForo itself and the forms system just submits the criteria to XenForo for a Meet/Not Meet answer. In other words, they either meet all of the criteria set, or they don't. There's no in-between. It would help if you said what criteria you have set and why you feel the user doesn't meet the criteria. Sorry for the ambiguity. Wasn't my intention. I have a custom field that is for the steamURL.. It expects a URL in that field. The test profile has a valid steamURL in the custom field but when I try to access the form it presents the no permission banner. Do you have any other criteria set for the form? 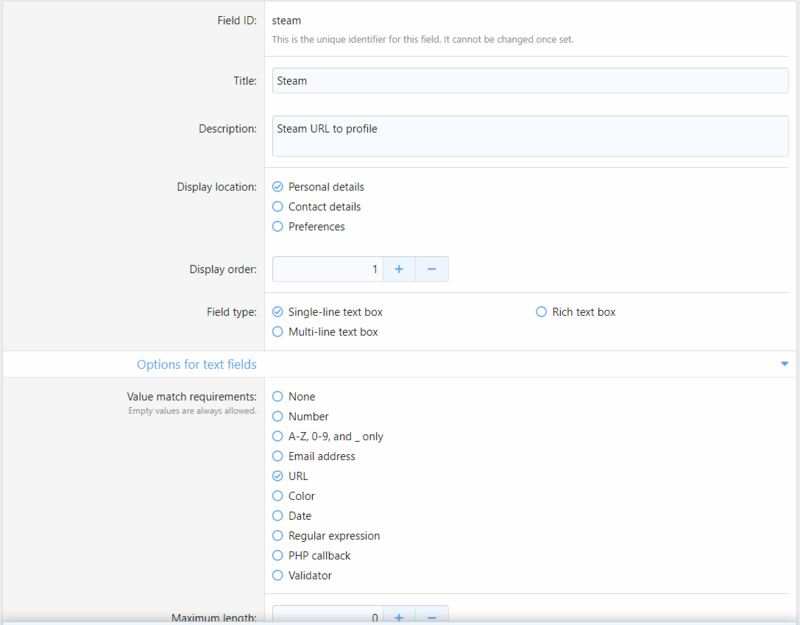 If you could take a screenshot of the criteria for your custom field, it might help. It sounds like you have it set for something XenForo doesn't recognize as a value for the field. In other words, if the field is a text field, a user must match what you have in the criteria exactly for it to match. 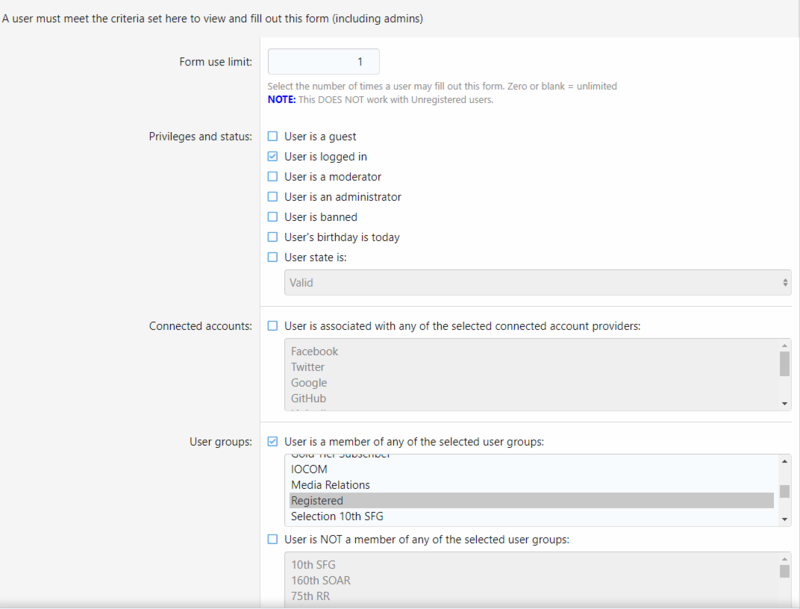 Usercriteria on form, is that it must be logged in and part of the "Registered" group. 3) (when active) Their custom user field does not exactly match what you have entered in the custom user field criteria (this must not be blank in the criteria selection or it it will always trigger a mismatch). This is a function of XenForo itself. It's not something that's under the control of the add-on. EDIT: If the custom user field contains a URL, enter http in the box. That will detect that the field has a url in it and return properly. If you're trying to detect if the custom user field is empty, that's not possible in XenForo. NOTE: There are a couple of bugs related to the default question system and the form titles using answers from questions. Someone is testing a new version that should fix the bugs. As soon as I hear back from them, I'll update the forms system here. I assume that update is also for 2.1, correct? There has been no update needed. It is compatible with 2.1. How can you download older versions?